Lot of celebrities, actors, media companies and brands use Facebook to interact with Facebook users. If your Facebook timeline is boring, you can spice up with updates from celebrities of your choice. To get started, search Facebook page of specific celebrity, brand or company. In a single click you can subscribe to respective updates on Facebook. 1. Open Facebook pages browser and login into your Facebook account. 2. 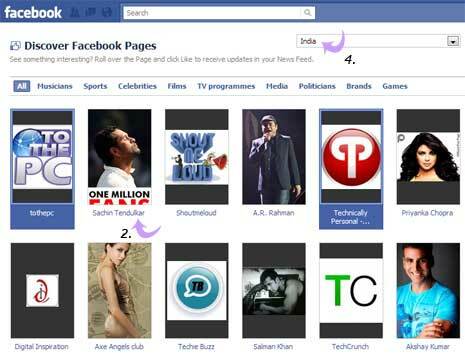 You will see listing of Facebook pages relevant to your country. Click on page image to subscribe to updates. 3. To visit specific Facebook page before subscribing to updates, click page link at bottom of each Facebook page image. 4. You can also browse and view Facebook pages for other countries. Select country of your choice from drop down menu at top right. You can filter listing of Facebook pages based on different categories like musicians, sports, celebrities, films, tv programs, media, politicians, brands, games and more. For sure one easy way to discover new Facebook pages to get more desired activity in your Facebook timeline.